I know, I know, I said there’d be a weaving update, but this is very nearly almost weaving. 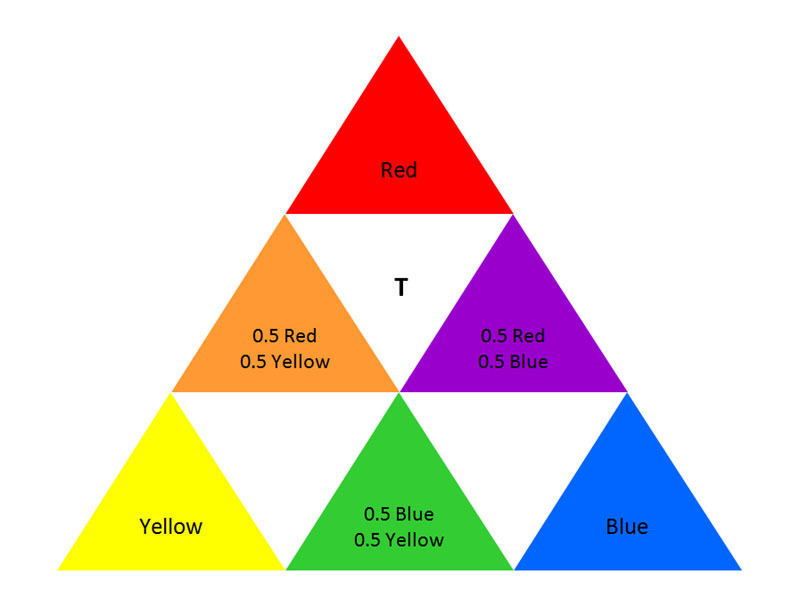 Goethe offered an alternative model in which the primaries … were the corners of a triangle, the secondaries the sides, and tertiaries the mixtures of the three surrounding colours. The three surrounding colours? I did a double take when I read this, as I had understood from the colour class — and from those notes — that the tertiary colours were made by mixing a primary and its complementary colour. Then I had a think: after all, there are only three primaries and in either case they are all represented in the mix. Imagine that we want to colour in the triangle marked T in this picture and suppose that each secondary colour is a 50-50 mix of the two neighbouring primaries. where a is the amount of red which allows it to dominate the mixture and b is the smaller amount of green. This, thank goodness, looks very similar to my mix of red and green above: I just need to substitute a = 2 and b = 1, which does indeed give dominance to the red over the green. From this little exercise I am satisfied that the two descriptions are most likely telling me the same thing and it is safe to go back to the loom. Now I will have to find my old art school notes to see what they say about Tertiary colours. I did some scouting around and found two distinct types of definition for tertiary colours. One kind of definition says that they include all three primaries (as in this case); the other kind is talking about the modern colour wheel and the mixing of a primary with an adjacent secondary so that you get, e.g. a red-orange rather than a “straight” 50-50 orange. That’s the definition I have been accustomed to, but it appears to be using recycled terminology!! I’d love to know what you learned at art school.